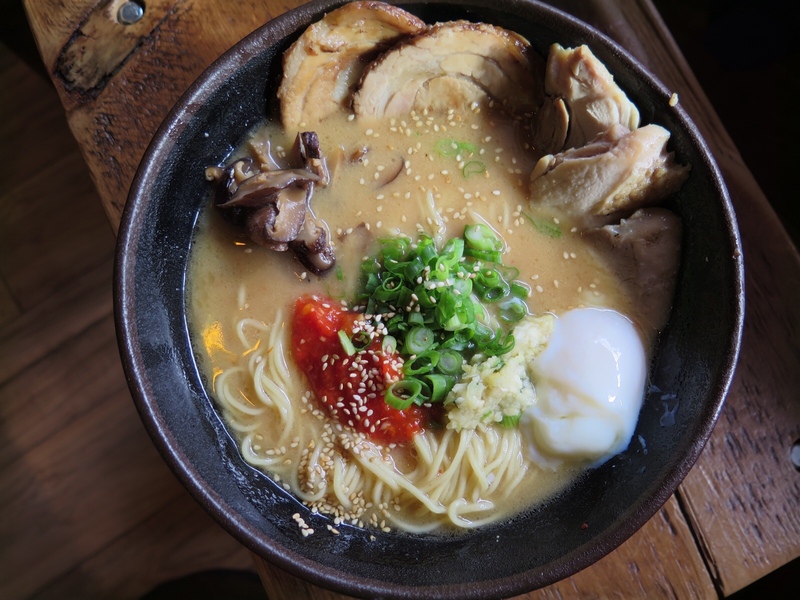 Located in the heart of Wicker Park, a few steps away from the four corners, is Shin Thompson’s (and the guys behind Takito Kitchen) noodle mecca, Furious Spoon. Created to imitate the style of the Ramen shops in Tokyo and to honor Thompson’s Grandfather’s Ramen tradition, the atmosphere is intended to be fast-paced-casual. 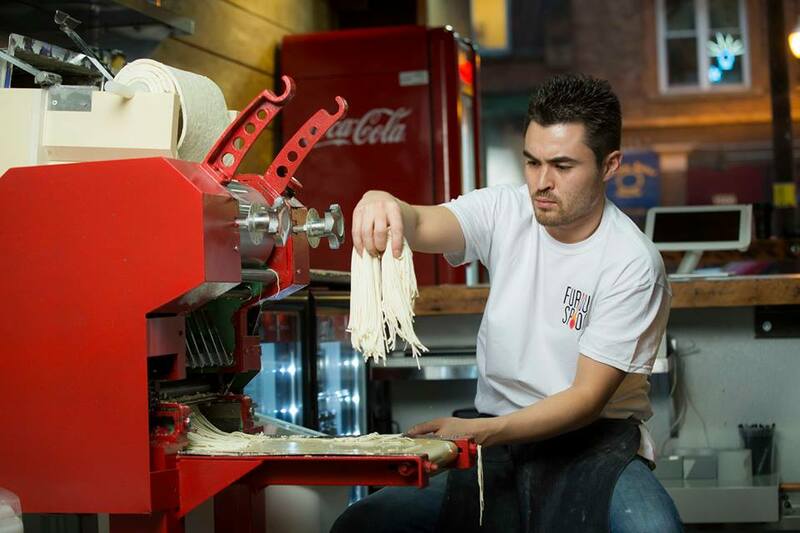 According to Thompson’s Grandfather, who once owned a very popular shop in Japan, Ramen is supposed to be eaten furiously to preserve the texture of the handmade noodles. If his customers did not follow his strict rules and slurp their meals at a rapid pace, he would then hit them with a giant wooden ladel/spoon (hence where the name of the restaurant was derived from). Although Shin claims he won’t practice his Grandfather’s spoon smacking, he plans to uphold the rest of his family’s traditions: making homemade noodles everyday, keeping a small line of “street” flavored bowls on the menu, and pricing each bowl economically ($7-12 each). To experience FS to the fullest, sit at the long, crowded communal wooden tables. Although you’re packed in as tightly as a “L” heating station during winter, being crammed is how Ramen is supposed to eaten. 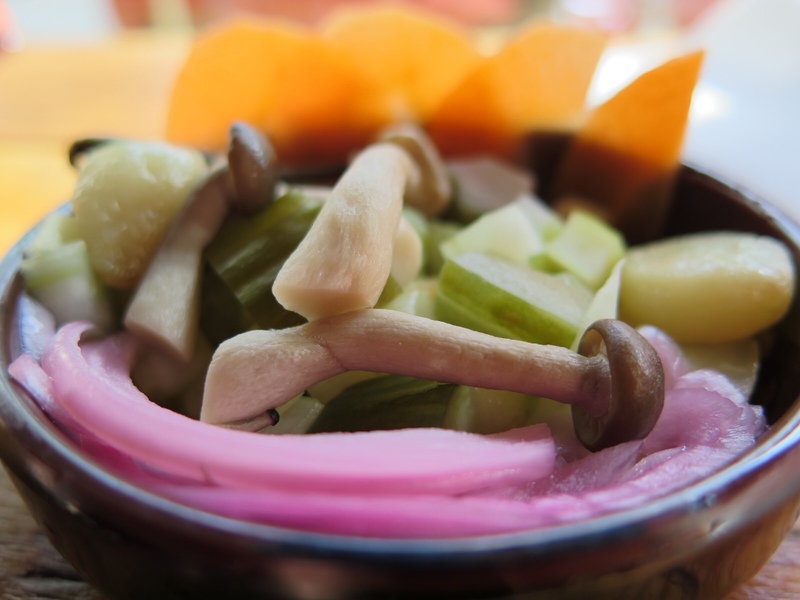 With five bowls on the menu, both hot and cold, all are started with the same base (pork bone stock) but differ by a variety of garnishes. Simmered for 18 hours, the broth Shin creates is certainly nothing short of a masterpiece. It is both light and thick with incredible depth, without being too salty. I read on Michael Nagrant’s review that FS uses a refractometer (an instrument used to measure the viscosity/thickness of a liquid) to gauge the quality of the broth for each batch. If that doesn’t show how dedicated Thompson is to the quality of their product, I don’t know what does. 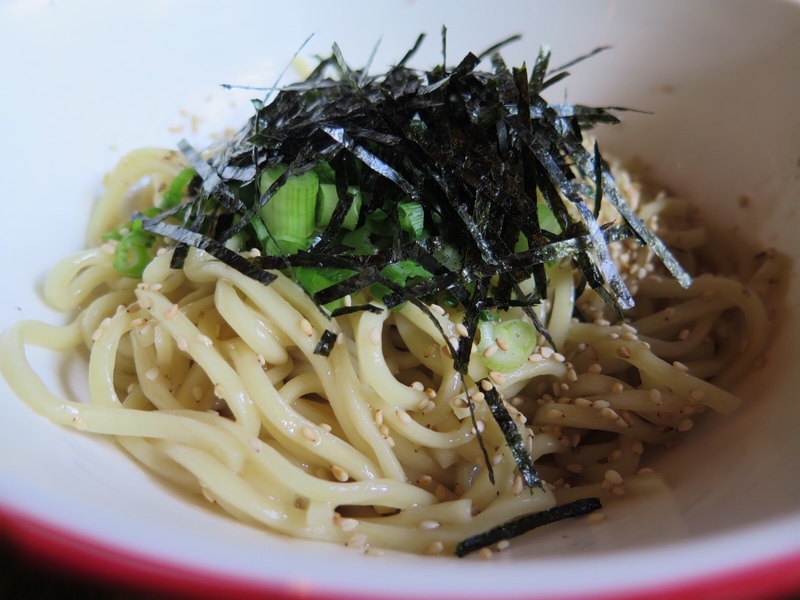 Besides its delicious broth, another highlight of each bowl is the texture of its handmade noodles. Believe me, it is nothing compared to the mass-produced-packaged “Ramen.” The noodles are long, springy, and have a distinct bite – you know, the bite you get when you know something’s been homemade? Absolutely delicious. Although the Furious Ramen was my preferred type of the bowls, mostly because it contained the most items, my absolute favorite type of Ramen that evening was the Tsukemen. Made up of long, cold dipping noodles, juicy chashu pork belly, scallions, nori, and spicy fury sauce (apple chili), this dish had the perfect mix of hot and cold elements, both in temperature and flavor. 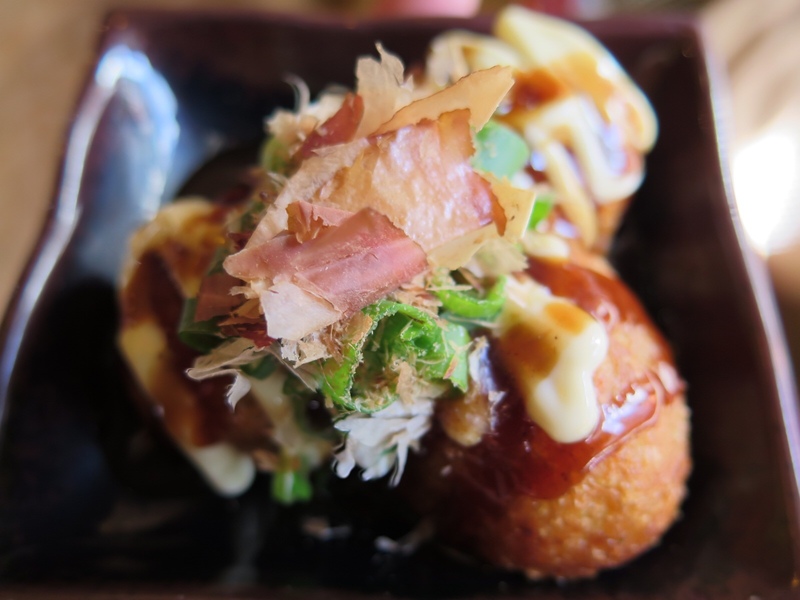 If you managed to save extra room in your stomach, other dishes that deserved recognition were the special “octopus balls,” fried batter containing, you guessed it, chopped octopus, and their classic pickled vegetable dish. If you are quick to judge both as seeming too simple and un-Ramen like, think again. The side dishes were just as impressive and exploding with flavor, not to mention a great way to finish or start your meal. Being open for less than a year, Furious Spoon continues to mature and thrive as a quick and casual neighborhood Ramen shop, exactly what it was intended to be. Shin still even serves large wooden spoons (but only for eating) and still encourages customers to eat their Ramen furiously, just as he has been taught. Although FS was opened on the end of the “Ramen-train,” phase here in Chicago, it’s clear that its traditional practices and incredible flavors are what sets it apart from the rest.